Juno Beach is a seaside sanctuary with atmosphere of privacy and tranquility. It is a coastal town in northern Palm Beach County with sandy shores, gorgeous ocean views, and a quiet, small-town atmosphere. 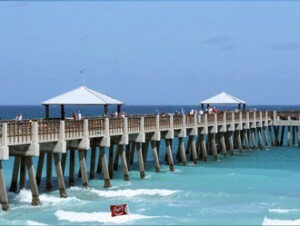 Approximately 43 percent of the land in Juno Beach is either County parks or environmentally protected natural areas, such as Juno Beach County Parkand Fishing Pier, Pelican Lake, and Loggerhead County Park. Loggerhead Park offers oceanfront nature trails as well as the Loggerhead Marinelife Center, an ocean conservation organization and sea turtle rescue facility. The beaches are clean, beautiful and great for all types of activities such as swimming, sunning, scuba diving, snorkeling, boating, kite surfing, and fishing. Juno Beach is a delightful seasonal or year-round residence. Single family homes, townhomes and condominium are available in a wide price range, including many with water views and beach access.